My apologies - I wasn't paying sufficient attention and hadn't noticed that the tweet above WAS NOT saying that the absolute minimum sea ice in 2018, when compared with the absolute minimum for other years, was the 3rd lowest on record. 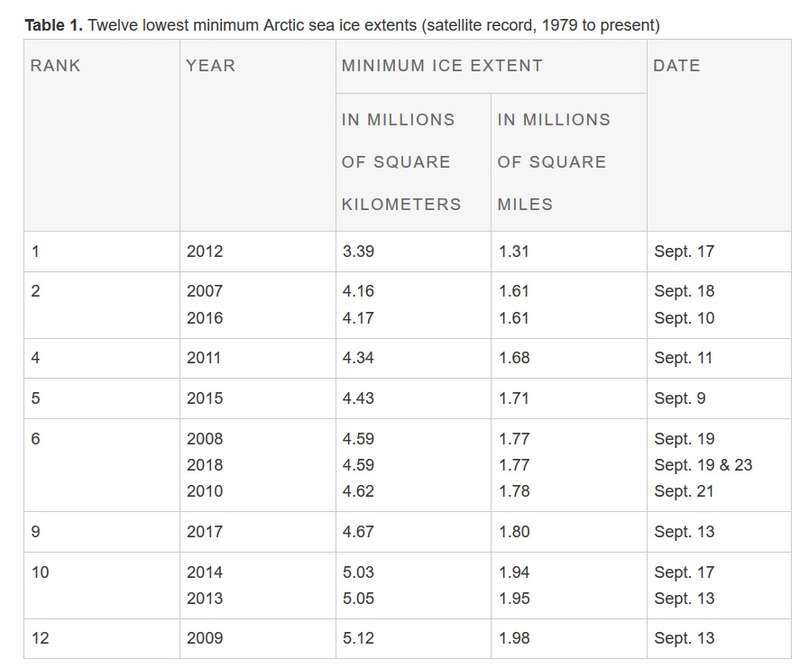 Zach Labe chose to compare the sea ice extent some days after the 2018 minimum with other years ON THAT DATE. Hence the "3rd lowest" statement. I'm disappointed in the tweet and I'm disappointed I didn't spot this. I shall be posting on here very frequently from now on with my main focus switching from the hurricane thread to this thread. I'll start with the latest ice extent charts. Arctic sea ice is running far below the 30 year mean - nothing surprising about that. The re-freeze has been quite fast in the west on the Canadian side but has barely started on the Siberian side and ice extent has even declined further in the Kara Sea! To compare the exact date (October 12th) with 2017, I show the NOAA chart below (the October 2017 NSIDC archive report shows a chart to October 5th). Note that the ice sheet last year (still well below the mean) did extend right across to the Siberian coast (more below). This summer we saw even more older ice thinning and melting (as has been highlighted in several earlier posts on here). Note how little (white areas) 100% ice concentration there is, even around the pole. 2018 ended up as only the 6th lowest on record (see below) following a slow down in melting through August - it had been challenging the record low year of 2012 before then. Unfortunately, with such little re-freezing, 2018 is heading for the lowest mid/late October extent on record (for that date). 2012 was recovering quickly through October. Weather and circulation patterns vary considerably and these can impact on ice build up in the short term but there are other factors in play, such as the anomalously high SSTs in the Arctic, particularly on the Atlantic side - I'll examine these again in my next post on here. Here we can see that 2012 was way below any other year but it reached its minimum extent in mid September. At that time, 2018 was the 6th lowest equalling 2008 (note that the previous 4 years + 2012 are shown but 2013 and earlier years are not as this chart is meant to be a 5 year comparison measured against the record low year). 2018 saw its lowest point in late September but has been slower to rise than in any of the earlier years. 2016 also had a slow recovery and that year saw the lowest extent on record from mid October and through into early winter. It looks like 2018 will see even lower levels within a few weeks unless a rapid re-freeze gets going very soon. Unfortunately, before I get into my temperature analysis, I can only bring some more very worrying news. Yesterday, the Arctic Sea ice extent has just become the lowest on record for this time of year. I reported on minimum ice extent in my post on October 13th (see the charts there). In September, 2018 ended up as the 6th lowest on record, roughly equal to 2008 and only above (in the order of lowest first) 2012, 2016, 2015, 2017 and 2013. 2012 was the record low year with a much lower minimum ice extent than in any other year. 2012 did start to see a fast recovery from mid September which accelerated further during October. This year, just like in 2016 has seen a really late and very slow recovery. Although recovery has accelerated during the last 10 days, the pace has been slower than in 2012. On 19th October, 2018 has crossed over and is now below 2012 as can be seen in the chart above. The only piece of better news (or less bad news) is the the ice sheet is now finally building across towards north east Siberia and the continuous expanse of open water on the whole Eurasian side of the Arctic looks set to be closed within a few days. Given reasonably favourable recovery conditions, this should help to enhance faster re-freezing as the surface currents effectively become dammed. There are currently wide areas of the Arctic close to or even slightly above 0c. This chart shows the mean 2m surface temperature anomalies for this month to date. Those mid-brown colours in the high Arctic and around the pole are some 12c to 16c above average - that is for all of October and is quite exceptional. Much of the Arctic region is running at well over 4c above the mean. Greenland and N America are below average and just a small part of southern Siberia is too. October 2017 for comparison - warmer than average but not nearly as warm as this October.. Finally 2012. Some very warm anomalies but nowhere near as extensive as in 2018. The -1.5c temperature and below (purple colours) are key as this is the level where sea water will start to freeze. Note the wide area which is still running closer to 0c (the dark blue colours). Even more of a concern are the vast expanses of water with SSTs well above freezing. We have become used to that in recent years on the Atlantic side particularly in the Barents and Kara Seas. This year the Pacific side also has worryingly high SSTs. The Bering and even the Chukchi Seas are also running well above 0c. This is a legacy of the very active west Pacific typhoon season which have pumped up some very warm surface waters unusually far north. Now the SST anomalies. Those dark brown colours are +ve anomalies in excess of 6c and the olive patches (such as south west of the Svalbard islands) are anomalies exceeding +8c. The only less bad news is that the North Atlantic is running below normal. That Atlantic cold pool for the last couple of years was mostly south west of Greenland. This year while the mid latitudes of the N Hem saw widespread record summer heat, further north it was much colder than usual. Iceland had one of its coldest summers for many years. Although SSTs briefly recovered they are trending down again. Right now, almost the whole of the North Atlantic from 50N to 65N is running below average. This should mean that with relatively less warm Atlantic SSTs, the Atlantic side of the Arctic may get a little respite moving into this winter. Sadly, it will take a lot more than this to lower those abnormally high Arctic SSTs which are partly a long term legacy from the 2015/16 super El Nino when the almost relentless, powerful jet stream pushed warmer waters right up to the edge of the ice sheet for prolonged period. I don't think any of this is a surprise. For those of us who have watched the arctic with concern since 2007 or so, the rate of overall melt is now on an increasingly steep gradient and we appear to have passed a tipping point that is likely to leave us in an arctic almost ice free in high summer in a worryingly short space of future time. This can only be bad news for the Greenland ice sheet and consequently sea levels. What will it do for the weather across the populated northern hemisphere continents? It surely has to help increase the rate of extreme weather events, of energy release that will upset traditional passage of the jet and pressure patterns across the pole. What will happen to cloudiness in the region given warm water and far reduced albedo? Beyond my knowledge but I'd be interested to find out. Will the gulf stream be substantially affected? Are we likely to see more SSWs? It's a worrying but also fascinating topic. Of all the regions in the world being affected by climate change the arctic has to rank No 1 for potential global impact down the line. Thanks to those for posting this information about the Arctic and sea ice. It is very concerning. This can influence jet stream patterns and PV disruptions. While the presence of more water increases storms, the presence of warmer waters increases high pressure (blocking). Not sure which is going to dominate, but it certainly makes a recipe for extreme weather events. Since Arctic sea Ice is instrumental in monitoring global temps, this is certainly not good. Hi @OleySnow welcome to "33" and to this thread in particular. I think that we can all agree that the declining Arctic sea ice is very worrying. I started this thread so that we can carefully examine all the facts and assess the rate of decline, put it into longer term context, look at the causes and the contributory factors and the ongoing and possible future impacts. You make some very valid points and these and others have been the subject of much speculation and discussion. There are many papers and studies out there. Some of these are highly controversial, usually those at each extreme of the climate change and global warming debate. Some really misrepresent the statistics to meet their personal agenda. Our job is to take a measured and balanced approach and sift out the facts from the fiction. Although I encourage you to use the portal, any of those titles above can be clicked on and this will take you to an abstract or summary so that you can decide if you wish to read the full paper or watch a video presentation and there is a direct link provided to these. There are some real gems in there including some very recent ones. Everyone who is interested in this fascinating and alarming subject is encouraged to contribute. 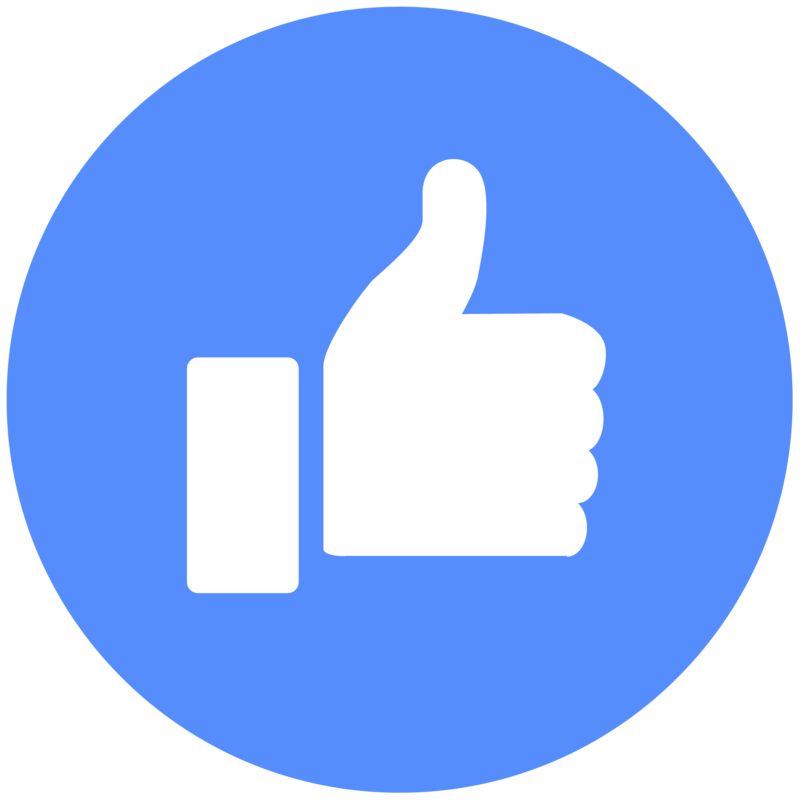 You may wish to review a paper on here so that we can comment on it. You may have a paper that is not in the portal. We shall be happy to add it - you can mention it on here, PM one of us (Malcolm, myself and also Zac @Snowy Hibbo who are the portal administrators) and there is an "Interactive Area" in the portal for members which includes instructions of what details we require for a portal entry. You may have particular questions to ask or points to make and let's do this in a respectful and friendly way which is particularly important for such a controversial subject with some pretty polarised views (almost literally ). @Catacol - yes for those of us that have been monitoring this decline in Arctic ice and the warming there for many years, the current struggling re-freeze season is definitely not a surprise. I first started my interests in the Arctic back in the 1960s. Back then all of the discussion was about expanding sea ice and whether we were moving towards another ice age! Malcolm @Blessed Weather will remember that, as will @Midllands Ice Age (UK) (we're all of a similar vintage). Then things started to change during the 1970s to 1990s but it is the sheer rate of change this millennium and particularly this decade which is most concerning of all. You make a number of key points and we can examine all of them on here. There is actually quite a diversity of views on whether we have already "passed the tipping point", whether or how soon will we see an ice-free Arctic each summer, how quickly will we lose almost all the older ice (that's more than 1 year old) most of it has already gone with practically no 5 year ice left and 2018 saw an even more rapid loss and thinning of older ice - worse in fact than the record low minimum overall ice extent in September 2012. I understand that a report on this will be published within a few weeks. You can bet that it will appear on here but we can also gather together information and charts for our own report. "Not sure if this belongs here, but why is Arctic warming so much more then Antarctica, what would be the scientific explanation to that, or any link to a research document?" This "Arctic" thread also covers Antarctica, Greenland, global ice and glacial ice. I did a post on page one of this thread on Antarctica and this included a comparison between that continent and the Arctic. The long answers are explained in that post. The short answer or main reason for the differences is that the Arctic is mostly an open ocean surrounded by land while Antarctica is a landmass surrounded by an ocean. Antarctica loses almost all it's sea ice each summer but much less of it's land ice. Only the outer edges of the continent rise slightly above freezing in the summer months and much of the interior stays well below. Overall, there has hardly been any "net" ice loss from Antarctica. The southern oceans have warmed up but what this has done is create a lot more moisture which has led to big increases in snowfall all the year around - even the "desert" areas near to the South Pole have seen increased snowfall. Much of the ice sheet is over 3km thick. The increased snowfall has caused the ice sheet to become more mobile. The Antarctica glaciers have sped up. When they reach the sea they break off making for dramatic headlines with huge ice shelves floating out into the ocean. This is seized upon by those at the extreme end of the global warming debate stating that we are losing ice down there at a rapid pace. This is actually not true. Total ice there has changed very little during the last 30 years and probably for much longer than that. West Antarctica has lost a small amount but this is made up for by the east making a small gain - the drier east seeing the greatest increases in snowfall. This is not to say that longer term climate change and global warming will eventually reduce Antarctica ice but right now that continent is helping to slow down the net global ice loss. There are a number of research teams and scientists down there conducting some very sophisticated monitoring and together with the latest satellite data (one new satellite now exclusively monitors that region) we should obtain some vital data to assess more precisely what is going on. This "Arctic" thread also covers Antarctica, Greenland, global ice and glacial ice. I did a post on page one of this thread on Antarctica and this included a comparison between that continent and the Arctic. The long answers are explained in that post. The short answer or main reason for the differences is that the Arctic is mostly an open ocean surrounded by land while Antarctica is a landmass surrounded by an ocean. Antarctica loses almost all it's sea ice each summer but much less of it's land ice. Only the outer edges of the continent rise slightly above freezing in the summer months and much of the interior stays well below. Overall, there has hardly been any "net" ice loss from Antarctica. The southern oceans have warmed up but what this has down is created a lot more moisture which has led to big increases in snowfall all the year around - even the "desert" areas near to the South Pole have seen increased snowfall. Much of the ice sheet is over 3km thick. The increased snowfall has caused the ice sheet to become more mobile. The Antarctica glaciers have sped up. When they reach the sea they break off making for dramatic headlines with huge ice shelves floating out into the ocean. This is seized upon by those at the extreme end of the global warming debate stating that we are losing ice down there at a rapid pace. This is actually not true. Total ice there has changed very little during the last 30 years and probably for much longer than that. West Antarctica has lost a small amount but this is made up for by the east making a small gain - the drier east seeing the greatest increases in snowfall. I figure it might be useful, for reference, to jot down the sequence of events (with approximate timing) that have taken the Arctic to where it is now from where it was at the end of the previous century. Here's what I have currently. Due to a very busy mind, I may have missed out or misrepresented some developments (and the timing of some is open to some debate), in which case please let me know and I'll add or amend them accordingly . - (2007-2012) Warmer Arctic temperatures coupled with favourable melt-season weather patterns in more years than not, resulting in significantly lowered sea ice coverage. - More exposed ocean brings about an even warmer Arctic in all but the summer season, reducing sea ice thickening during the freezing season. - Warming reaches a magnitude at which it starts to significantly weaken the Oct-Apr polar jet, permitting higher amplitude (larger N-S span) Rossby wave formation. - These higher amplitude waves simultaneously transport more warmth and moisture into the Arctic, and draw more cold air out of it. - This further disruption and reduction of freezing season cold leads to additional anomalous open waters and relatively high temperatures, perhaps aided by changes in the ocean currents due to the effects of the anomalously large solar-ocean energy transfer. - (2013 onward) The summer season sees a destructive feedback (relative to sea ice melting) in the form of increased cloudiness as a result of the extra moisture input from the anomalously exposed areas of ocean surface. However, while this reduces solar-driven melt, it doesn't inhibit ocean-driven melt or that from mechanical action relating to storms - and there are signs that the additional moisture plus more amplified planetary waves can support more frequent and stronger storms than in previous decades. As a result, we see the Arctic resisting new record minimums of sea ice extent, but the overall thickness of the ice remains near or at record-low levels. - (2016 onward) The autumn-early winter Arctic undergoes transformation toward a climate that is more oceanic than continental, resulting in a more resilient divide of high latitude cold pooling between the adjacent continents, raising the potential for the predominant cyclonic circulation (polar vortex) to establish over one or both of these regions at a location further from the Arctic Ocean than usual. Such a displaced vortex provides another means for large-scale transport of warm air into the Arctic and of cold air out of it - and so the situation constructively feeds back on itself as we're currently being unfortunate enough to witness. Phew. The situation's also become noticeably more complicated with time! I was planning to do this update next week but with the recent interest shown in Antarctica, I've decided to bring it forward. Firstly I should repeat what I said in my introductory post - when I opened this "Arctic" thread" I always intended it to include Antarctica (see page 1 for my first post on that with loads of facts about it and comparisons to the Arctic) as well as Greenland (I'm planning a post on that later this week), global and glacial ice (posting on that in due course). If we really are going to examine global warming impacts on the Arctic and Arctic warming impacts on the N Hem (in particular) and make a fair and balanced assessment on this thread, then we must include global ice conditions. The Arctic gets most of the publicity due to the very rapid decline of permanent and older ice, the exceptionally high +ve SST anomalies up there and the very high 2m surface temps and I updated the current position on all of these last week. it's also surrounded by populated countries and closer to the N Am and European continents where much of the interest is generated. Meanwhile Antarctica gets far less notice, being an isolated continent. It is however, actually even more important than the Arctic and is the biggest contributor to slowing down the rate of global ice loss (more below on this). In this post I will look at the current ice extent, the SSTs and the land temperatures down there and put this into context. Before I do that, just a word about James' @Singularity post on here this morning. That's a really nice summary of the recent warming trends in the Arctic and describing part of the feedback loop which has caused what a few call runaway or out of control ice loss and is very much what we shall be examining on this thread. I did a very long post on here "Arctic Report (5) - Longer Term Ice Extent - Putting The Current Position Into Context" (on August 18th, halfway down page 1 on this thread) and I went back through the satellite period which started in 1979 and then further back to 1850 with data based mostly on shipping logs and then a glance at the last 1,450 years where recent very sophisticated research into ice core samples and deep ocean floor sediments have given us a surprisingly accurate record of past ice extent. I really want to encourage a lot more contributions into all of this - facts, figures, analyses and paper reviews and an active debate. Very soon, I shall start reviewing some of the most relevant papers that I placed into the Research Portal and I know that Malcolm @Blessed Weather intends to do the same. Right, on with my post. I shall comment below each chart. Compared to the Arctic, Antarctica's winter sea ice extent is usually much closer to the 1981-2010 mean and in some years, including some quite recent ones, it has actually been close to or exceeded long term record highs such as in 2014 and previously in 2012 (see below). These charts show us 3 different decadal mean periods since the full satellite imagery records started in 1979. It includes the two record high years of 2012 and 2014. We can see that 2018 was running slightly below the means at its minimum point in late Feb/early March and still very slightly below the means right through to the maximum extent in their winter. This chart tells us that 2018 had a blip in mid- September (due to unfavourable circulation patterns for several weeks bringing warmer than average temps at that time). 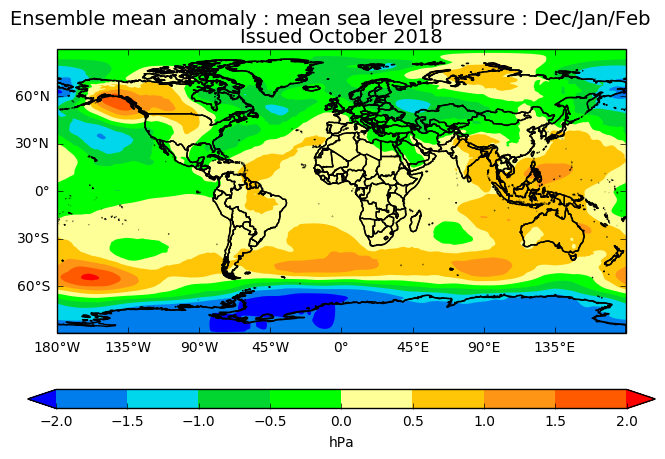 Then the pattern changed and 2018 actually saw a very late maximum in early October, although 2017 saw an extremely late maximum. Now this chart is not as important compared to the same one for the Arctic. Being a large land mass the winter sea ice that forms around the coast extends out to relatively low latitudes. The vast majority of sea ice melts each summer and there is practically no older sea ice. The sea ice sheet that reforms each fall is therefore not that thick. I will do another post at some stage on the land ice which is so important and plays a key role in global ice extent. This chart is very simple at this time of the year when we have just seen the annual maximum ice extent. SSTs are mostly below -1.5c right out towards 60S. The white areas over and around Antarctica are not neutral conditions, they are ice covered. Much of the ice free regions have -ve anomalies as they have for much of the last 3 months. This global map shows us the actual values. Even out to just beyond 60S SSTs are close to 0c with values ranging from -2c to +6c. Until mid September -ve anomalies prevailed over much of the southern ocean and often well beyond 60S. They have recovered slightly with neutral to slightly +ve anomalies now prevailing but still with some regions of -ve anomalies. How different all this is to the exceptional high Arctic Ocean SSTs! Antarctica has been affected by global warming but in a very different ways to the Arctic. The temps over the main land mass are actually fairly typical with a trend in the last few years to more +ve anomalies in the west and more -ve anomalies in the drier east. Note that this is not always the case but a slight trend and the contrasts are slightly greater than normal right now. Highest +ves are around 3c to 5c above and lowest -ves are around 3c to 4c below. If you look to the text to the left of the chart this gives some more precise figures. The western landmass anomaly is on average +0.8c while the east is -1.2c (k = kelvin = celius and I'm not sure why they use the kelvin scale). If we include the sea + the land the 60S-90S has a -ve anomaly of -2.4c and going out even further to 66S-90S it is still a -ve of 1.5c. So Antarctica itself, plus its surrounding sea ice and much of the southern ocean as a whole is substantially colder than normal. There is currently some dense cold air over the ice sheet to the north-north west with -ve anomalies as much as -12c there. This chart is suggesting that the UK Met Office GLOSEA 5 model is predicting that MSLP will be "slightly" below average during the Antarctica summer. I'm not sure how accurate their forecasts are for that remote region. It's a long range forecast and is subject to change. Slightly lower than average pressure there would produce slightly stronger winds, slightly greater moisture and greater snowfall on the main landmass, perhaps being carried further into the interior than usual. Let's have a quick look at the current pressure charts. The default pattern is higher pressure on the land mass, particularly over the inland high ice sheets and towards the interior where polar easterlies predominate all the year around. Then low pressure dominating from 60S to 40S ("The Roaring Forties" are the anomalous strong westerlies at 50S to 40S). So Jules, the answer is that this is not a particularly strong anomaly - just slightly lower pressure than usual predicted to predominate during the Antarctic summer. I hope that this answers your question. I have been intending to do a post on Greenland for some time. This is a vitally important part of the Arctic region and contains a high proportion of the permanent land ice in the Arctic. Some of the news is not nearly as bad as one might believe. In this first report I'll look at the current ice extent and temperatures in Greenland and put these into context. I shall also explore some longer term figures. I shall begin with a few geographical, geological and ice sheet facts. This introductory post is necessarily a long one but my future Greenland posts and updates can refer back to this one as a reference point and can be much shorter! In this part I am pulling together some of the fascinating facts about Greenland's geography and geology and I draw heavily on data, maps, charts and photographs from Wikipedia. Greenland has an area of 836,330 square miles. To put this into context, the US is about 5 times bigger than Greenland but Greenland is 9 times larger that the whole of the UK. The island has 27,554 miles of coastline. It stretches for 1,656 miles from north to south between its longest points and 750 miles from east to west at its widest points. Permanent ice still covers most of the landmass at the time of the summer minimum extent. The ice sheet has an area of about 660,000 square miles, a length of 1,500 miles and a width of 680 miles. The average ice sheet thickness is 6,600 ft to 9,800 ft. Much more on this, seasonal variations and longer term trends below. The country looks much larger than it actually is on most global maps due to flattening out the earth's surface. The map above moves Greenland alongside Africa for a true comparison. Greenland is very mountainous. If we removed the ice, the island would like it does in the map above. The highest point is Gunnbjorn Fjeld at 12,119 ft and this is the highest peak inside the whole of the Arctic circle - it's located in the east at 68.6N and 29.5W. There are high plateau regions in much of the south and the east and also in parts of the west and, to a lesser extent, in the north. Much of the eastern plateau is well over 2,000 m (6,500 ft). A few of the models (such as JMA) do not adjust mean pressure to sea level equivalents and as pressure is much higher over the elevated plateau this "can" give a very false impression with MSLP sometimes overstated by well over 25mb! This photograph from the eastern coast shows how the high mountains and the plateau extend right up to the sea for long distances. Parts of the centre of Greenland, particularly further north are close to or below sea level as can be seen in the "iceless" map above. Surface lakes have been discovered as well as unfrozen water under deep layers of ice. The Greenland ice sheet is actually very mobile. There is some very dense ice in the thickest parts of the ice sheet. Snowfall accumulations in the centre is steadily compressed into ice that flows towards the outer margins just as in Antarctica or with other larger snow fields and glaciers. Very close to the edges, the ice melts in the summer half of the year and also breaks off into icebergs. Snow deposited on the central parts of the ice sheet is gradually compressed into ice. To give an idea of this compression, new snow falling onto the ice sheet has a density of around 60 kilograms per cubic metre while water has a density of 1,000 kilograms per cubic metre. In the central part of the ice sheet the temperature never rises above freezing so the snow never melts (not even with Arctic amplification and warming). Instead, it becomes buried under new layers of snow, with the weight of the new snow increasingly compressing the layers below and steadily becoming denser. Once the density of the snow reaches 830 kilograms per cubic metre, which is around 80 metres deep, all the air passages between the crystals are sealed off so the only air that exists is in trapped bubbles. As the depth increases the density of the ice increases further and at 917 kilograms per cubic metre air bubbles are compressed. At this stage the ice has become glacial ice and it cannot be compressed anymore. In this section I shall rely heavily on the latest NSIDC data. This time of year the ice sheet is normally expanding with little or no melt. The white area is where there is no melt and red areas (none now) where there is melting in progress. The grey areas nearer the coast are beyond the main (thicker) ice sheet but are not ice free and in fact they are all snow covered right now. NSIDC explain: "The satellite sensor’s resolution is not fine enough to distinguish ice from land when a pixel overlaps the coast." This map shows the cumulative melts days for this year to date. The white areas are zero. Around the margins the reds and pinks tell us that there has been some net melting on 60 to 80 days this year. There are one or two isolated tiny brown areas with around 100 melt days. Widely below -20c and much of the central eastern plateau is below -40c. I included 2018 (blue line), 2017 (green line), 2012 (yellow line) and 1980 (black line) and compare all these to the 30 year mean, 25 year spread and 10 year spread. It's a somewhat busy chart but I wanted to show the most recent years, the record high melt year of 2012 and the lowest melt year of 1980 for the whole 1979 to 2018 period compared to the longer term averages. Interestingly 2018 had a late start as well as an early finish - so a very short melt season but with some periods of strong melting in mid-summer. 2017 had a longer melt season but with much lower melt rates for much of the time. 2012 completely dwarfs the other years with some exceptional melt rates. The early end to the 2018 melt season is unusual and actually ahead (below) the 30 year mean and well ahead of the decadal average. This is very much due to circulation patterns. It can hardly be down to low solar activity when much of the Arctic region is so warm right now. This chart shows the model results for the Greenland Ice Sheet snowfall and melt runoff since 1960. The model (MAR 3.9) was run using input from National Centers for Environmental Prediction (NCEP) weather reanalysis data. The surface mass balance (SMB) refers to the net difference between snowfall input and meltwater runoff, or evaporation, loss. The bars show the relative difference from the 1981 to 2010 reference period of observations and modeling. Not only did 2018 have a short melt season (the yellow bar) which overall was actually below the 58 year mean (the 0 axis), due to its brevity but it has seen the second highest snowfall year to date (the red bar) for the entire period and with 2 more full months to go, it's likely to smash the 1972 record - so a truly exceptional year and some very good news for a change but there is a slight "possible" downside (see my quote from the NSIDC report below). The surface mass balance (blue bar) has seen a lot of negative years since 2006 mostly due to the very high melt rates. 2018 to date has the fourth equal best SMB since 1960, the highest since 1996 and may well end up in second place behind 1972 (no more melting and further snowfall still to come). ...." exceptional winter snow accumulation and heavy, summer snowfall, drove the net snow input mass to 130 billion tons above the 1981 to 2010 average. This was followed by a near-average melt and runoff period, resulting in a large net mass gain for the ice sheet in 2018 of 150 billion tons. This is the largest net gain from snowfall since 1996, and the highest snowfall since 1972. However, several major glaciers now flow significantly faster than in these earlier years. The net change in mass of the ice sheet overall, including this higher discharge of ice directly into the ocean, is not clear at this point but may be a smaller loss or even a small gain. This is similar to our assessment for 2017, and in sharp contrast to the conditions for the preceding decade. Persistent winds from the northeast triggered high snowfall for 2017 to 2018 along the eastern Greenland coast. These winds blew across open ocean areas allowing the atmosphere to entrain moisture and deposit it as heavy snowfall on the ice sheet....."
The top graph shows the 2018 reflectivity trend for the entire Greenland Ice Sheet through September 15, and four reference years: 2000, 2010, 2012, and 2017. The grey band represents the 5-to-95 percent range for the 2000 to 2009 reference period. The maps below show average monthly albedo, or solar reflectivity, for July 2018, on the left, and August 2018, on the right. ...."High winter and spring snowfall, and a moderate initial pace of melting, resulted in a more reflective (higher albedo) surface for the ice sheet than in past summers. Since bright, fresh snow blanketed areas that were once darker, such as dirty snow or bare ice, July’s average albedo for the ice sheet was 5 to 9 percent above the 2000 to 2009 reference period. Wet snow also has a darker surface, or lower albedo. Increased surface melting, above-average temperatures, and the three spikes in melting, August’s albedo decreased to more average values. However, the albedo along the western coast remained above average....."
Since August we have seen the early end to the melt season, those below average surface temps (well below this month) and continued above average snowfall. It's highly likely that the albedo has been very strong during the last few weeks. What a fantastic post, crammed full of facts and figures and many new to me. Thank you David! Thanks for this brilliant report. It was for last Sunday (21/10/2018)… and 4 days later things have changed a bit. Your final summarising paragraph, I feel needs to be 'brightened up' slightly. The last 4 days have seen this year playing 'catch up' bigtime with flash freezes in the key Russian side areas of Laptev and the ESS. Also there are considerable signs that Kara is now joining in (next door). Ice extent is now well above 2016, at this point, and within the next few days, with Hudson and Baffin (early) also going into rapid ice build mode, we could well see 2018 back into the pack once again. To give you an idea, JAXA has recorded Arctic sea ice gains of 800K Km2 (Oct 21st 6136K Km2 and today the 25th is 6933K Km2) in the last 4 days since your report. That is one of the quickest gains on record. Maisie has recorded even more. 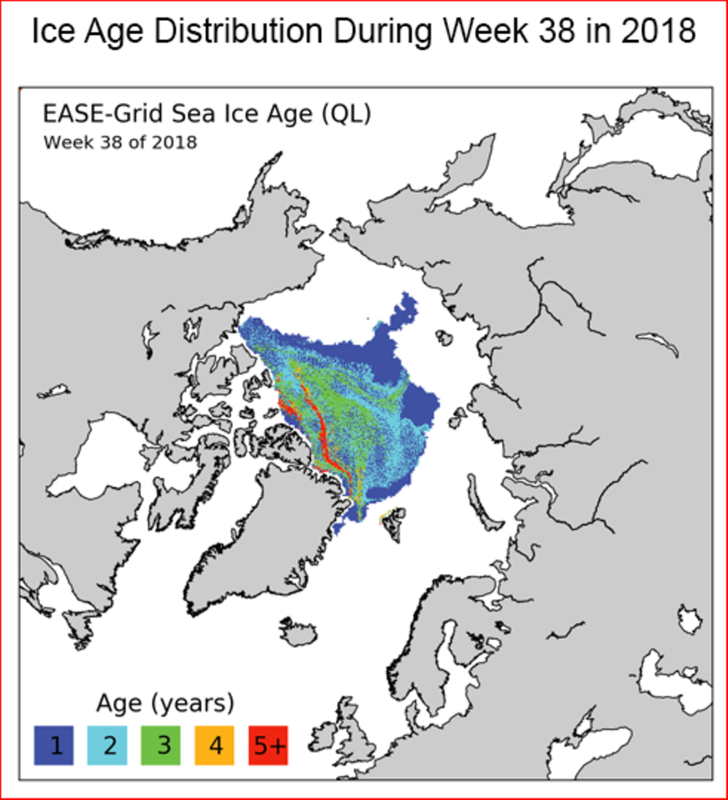 Note this post is not intended to be bullish, but to point out that after the very slow start this year, a rapid ice build up was to be expected, and apparently is, occurring. The current situation, with a large northerly outbreak into the UK and Europe, will have affects into the Arctic. It will be interesting to monitor the Arctic ice extents for the ice impacts over the next few days. I was going to do a short update anyway but I decided to respond to "MIA" on the UK thread and now I'm copying it here. I also posted several hours ago on the "Countdown to Winter 2018/19" thread with an update on Northern Hemisphere snow cover and that post and this one should be read in conjunction to see the complete snow and ice position. Thank you for your kind words MIA. They say a week is a long time in politics - well 4 days is a long time in the Arctic re-freeze season! I'll do a quick update and also make a comparison to 2016 which is likely to remain the competing year during the next few weeks for the unfortunate title of the lowest ever ice extent for the time of year. If we move away from the precision of the two calculating methods and just focus on the charts we can see what has happened in the last couple of weeks. We should bear in mind that October and November usually see the faster rate of ice extent recovery with just a few exceptions. Quite often seasons with a slow start or coming from a very low minimum extent need to play "catch up" and we see even faster recoveries. 2012 saw that record low extent but by mid October it was recovering so quickly that both 2016 and 2018 have fallen behind. 2016 and 2018 have crossed over 3 times since the re-freeze commenced and during the last week or so have been running almost neck and neck. As they are competing for the worst ever position we can track the differences. In the first "area" chart for Wednesday, I would say that it's a tie. In the second "extent" chart, you are right to say that 2018 has once again edged ahead. As you say, the strong recovery continued yesterday and into today. There is a fascinating array of data, charts and links on the JAXA site as well as on some other sites and there is a slightly larger spread of differences between the two years (in both directions). I just went into this detail to make the point that we can only ever take a close approximation at best. One thing for certain is that both 2016 and 2018 compared to other years have the lowest extent on record for late October. Let's look at the trend and what might happen during the next few weeks. Then, if we look at the earlier JAXA chart, 2016 had a pause during the last few days of October with the rate of recovery very small indeed and October 27th was just before that month end stall. Now, I believe that we are pretty likely to see a 2018 stall too. Let's look at the 2M surface temperatures and SST charts for both years. Surface temperatures were running well above average in 2016 but not as high as in 2018 in the high Arctic, closer to the Pole. Arctic sea ice minimum extent usually occurs during September. This year it was reached quite late on September 23rd. 2018 tied with 2008 seeing the sixth lowest minimum on record. This as well as the very slow rate recovery have been discussed in recent posts on here. Although these extremely low levels of minimum ice extent are bad enough, even more worrying is the decline of older or multiyear ice. During the winter season new ice that forms over open water can grow up to 1.5 to 2 meters thick. This "first-year" ice is highly likely to melt the following summer. Any ice that survives the summer melt can grow at least twice as thick as first-year ice. The older the ice, the thicker it is likely to be and the more likely that it is likely to survive the next and future melt seasons. The chart below shows the distribution and age of the ice that survived the 2018 summer melt season. Week 38 end on September 23rd, when minimum ice was reached. Much of the surviving ice was 1 to 2 years old,rather less was 3 years old, a tiny amount was 4 years old and there was very little 5 years or older ice remaining. The next chart really puts this into context. During the 1980s almost half of the ice remaining was more than 5 years old. This has declined pretty steadily ever since and now there is practically no 5 year + ice remaining. There is even less 4 year old ice. 3 year old ice has been more variable and only declined slightly. 2 year old ice was remained fairly constant as has 1 year old ice but remember this is at the expense of older ice. Overall minimum ice extent has fallen from around 6.6 million square kilometers in 1985 to around 3.6 million in 2018. Multiyear ice (2 years and older) has fallen from around 4.4 million in 1985 to just under 2 million in 2018. The 5 year and older has has declined from around 2.3 million in 1985 to under 0.1 million (actually 94,000) square kilometers (36,000 square miles) this year. This chart shows us the thickness of the current ice sheet in meters. The ice that formed in the last few days on the Siberian and Russian side of the Arctic is just a few inches thick - up to 0.25m thick (the mauve colour). The ice is progressively thicker the further west one goes. Much of this from the pole towards the Canadian Arctic is 2 to 3 meters thick. There is some that is over 3m thick and tiny patches of 4m or thicker ice. Compare this to the average thickness of the Antarctica and Greenland ice sheets which are 2,000 to 3,000m. Sea ice is much thinner than land ice but what there is in the Arctic, is generally thinning and melting. This is the best thread on the Arctic and the general cryosphere I've ever read. Just an incredible amount of valuable information in here. Absolutely fantastic job! Thank you for your kind comments about this thread and welcome to the 33andrain forum. I'm from a UK forum but use this one most of the time now (run by great people like Geoff @33andrain and Pat @NJwxguy78) but still do some cross-posting onto both forums, especially the Arctic and Antarctica threads. You can see my comments on the introductory page where I'm very concerned about climate change and global warming impacts I'm passionate about maintaining a balanced view as this is the best way to sift out the facts from the fiction. So far most of the posts on here have been factual and with loads of statistics and charts. I still want to get my posts done on glacial ice and finally on global ice. Then I will start reviewing some of the most relevant papers and presentations and encourage others to do so. Geoff gave us (a small group) great support so that we could develop the Research Portal on this forum and this is another reason for my completely favouring this forum. We already have a good number on the Arctic and Antarctica as well as on climate change with loads more to add. I want to encourage anyone who is interested in this subject (the Arctic, Greenland, Antarctica, global ice extent, climate change and global warming) to get involved with contributions, whether on the facts or in a respectful and friendly debate with carefully argued opinions. Together, we can all get at the real facts and analyse those without all the politics and extremes at either end of the climate change debate. I've taken a keen interest in the Arctic since the 1960s and back then all the talk was about the next ice age and snow blitz theories etc. How things have changed. @Sundog! Hope all is well. I intend to cross- post this onto the Countdown to Winter 2018-19 thread, the main Hurricane thread (not the archived Florence thread), the Arctic thread, the Teleconnections thread and the Climate Change thread as it relates to all these threads. Why, I hear you ask? - I'll explain in a minute. I was reading through some Arctic related papers and presentations when I came across this fascinating YouTube presentation which I have just placed into the Research Portal. This had a lead in headline of "Hurricane Florence and Arctic Sea Ice" but the presentation is entitled: "How Global Warming and Arctic Ice Melt Intensify Hurricanes" but it covers a lot more than that and includes implications for the North Am climate and the upcoming CONUS winter. I found it on the Arctic Sea Ice Blog which I read from time to time. Last month Real Time News interviewed Dr Jennifer Francis, the well known research professor at Rutgers University's Institute of Marine and Coastal Sciences in New Jersey (since 1994). I'm sure that some of you will be familiar with her work. She specialises in atmospheric sciences. She has produced many papers and features in a number of presentations. In recent years she has been focusing in studying climate change, Arctic amplification and ice loss and how this impacts on extreme weather events. In 2015 she was the one who first suggested that global warming and Arctic sea ice loss was starting to effect the jet stream. The initial reaction from a few fellow meteorologists and climatologists was to dismiss her ideas and research findings by claiming that the jet stream had started to behave differently around 15 to 20 years earlier and prior to the more recent ice loss. Like many new theories, the "establishment" often take a while to realise that there is far more too them than they first thought or perhaps "wanted to believe"!. Part of the controversy was simply due to the type of theory which went right into the heart of the global warming and climate change debate. I have always tried to take a very balanced and open minded approach to this subject that has such extreme and polarised views. Jennifer is very concerned about the impacts of global warming but all that she has been doing is researching how the changes which have been happening (however much they are due to human induced activities or natural variability or, as I tend to believe a combination of the two) are impacting on the global weather patterns and what might we expect going forward. It starts off with that cool Atlantic pool which has form off the southern tip of Greenland several years ago and how this has impacted on the Gulf stream. This is developed into an explanation of how this was partly responsible for the unusually positioned HP ridge which steered hurricane Florence into the east coast. Then this is also related to hurricane Harvey and Sandy. A more detailed explanation of the weaker and changing Jet Stream follows. She distinguishes between natural processes in the warming Pacific and unnatural processes like the warm NPAC and the ice loss in the Bering Sea and off Alaska..
You will see how this impacts on the whole N Am weather patterns and further afield. The final topic covers Super Typhoon Mangkhut and its intensity, excessive rainfall and the storm surge impacts are largely put down to climate change. How Global Warming and Arctic Ice melt Intensify Hurricanes - YouTube Presentation From there, you will find a quick link to the 13 minute presentation.